Lacy crochet is delicate and stunning. This collection is full of wearables for warmer days. When the spring season approaches, we prepare for the warmer weather and the lighter garments. If you're in the process of putting away your bulky yarn then you're on the right track because we have some beautiful light and lacy crochet patterns to share with you. 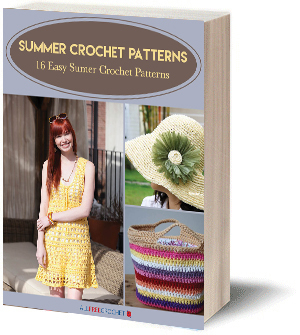 This collection, 24 Light and Lacy Crochet Patterns, is full of the most beautiful wearables and decor that are lightweight and lovely. Using lace, cotton thread and fine yarn can really create stunning crochet patterns. What's even greater about the spring season and the lace crochet patterns is that we start to see those lighter pastel yarn colors that give a fresh, new look. If you're unsure of what to crochet this season then we're here to help you out. From free lacy crochet patterns like lightweight shawls to crochet doilies to spring-ready scarves, there is something in this collection that will wow you. Grab your lace and your smaller crochet hook sizes and let's have at it. Flaunting your crochet patterns is one of the proudest moments you might have as a crocheter, and it's hard to do so during the winter. During the spring you can wear your fabulous lightweight crochet shawls without covering it up with a coat. These shawls, sweaters, and wraps are beautifully worked up with loveable light lace. This particular crochet shawl pattern is ideal for the experienced crocheter, as it is worked in 10 motifs that are joined as you work. Looking for some new free crochet patterns? The Lovely Lace Vest is a great item to add to your closet. Perfect for summer! This free crochet pattern is very customizable. You determine the length and width of this chevron lace sweater by trying it on as you go. This light and lacy crochet design is perfect for cool summer evenings or crisp autumn days. You can never have too many classic shawls like this. Light and airy, this delicate lace stole is truly a wonder to behold. This free, easy shawl crochet pattern is worked up in a beautiful cherry color. Using this free crochet pattern you can crochet yourself an elegant-looking shawl inspired by a vintage doily. Eco-friendly yarn is the way to go. Prepare your wardrobe for the sunny summer with this stylish cover up. This delicate crochet design is an intermediate pattern to complete. You can make this crochet pattern using any color lace you want. Make many of them so you have options. The flowers add a nice embellishment. Ladies, this is a beautiful pattern to add to your wardrobe. Use any color bamboo thread to complete this free crochet pattern. This lovely shawl is made using Red Heart Soft yarn and a lace loom. It's an easy crochet pattern you will want to make in your favorite color. Get the look of lace with this elegant off the shoulder sweater. A pattern like this one is perfect for you. It has three quarter length sleeves too. The beautiful lace pattern on this classic-looking duster makes it a great project for an intermediate crocheter. All the effort will be worthwhile! This Eye-Catching Pineapple Wrap is definitely a head-turner. You'll look and feel like a princess each time you wear this beautiful crochet wrap. Summer is a time for airy crochet lace patterns, especially when they are a soft pink! This cute crochet shrug is the perfect addition to any outfit. Who said crochet scarf patterns are just for winter? Using lightweight yarns can create some of the most stunning scarves out there. Scarves are the perfect spring and summer accessory that your wardrobe might need. Instead of long dangly necklaces, why not whip up a pretty scarf? Find your perfect crochet lace scarf free pattern here. The light and lacy design makes this the best accessory for the spring and summer months. It's an easy crochet pattern to work up as well. The brightly colored yarn used for this free crochet scarf pattern will add the perfect splash of color and stylish flair to your outfit. This crochet scarf pattern has so many interesting qualities about it. Plus, it's light enough to wear in the spring, summer, or autumn months. This stylish scarf is the perfect crochet scarf pattern to make. It's light but substantial and can be used as an accent or subdued piece. Get ready for the best accessory of the season with this Special Summer Lace Scarf. This is your chance to work up a pretty lace design. Using bright crochet colors and this crochet scarf pattern you can wear the ultimate scarf all season long. And then some! Not all scarves and cowls are made with winter in mind. This Summer Lace Cowl is a light crochet pattern that is perfect for warmer weather. The sunset coloring fades perfectly to give off a fun and fresh vibe. This project is also quick, easy, and only takes about a day to complete. What is your spring or summer clothing essential?